Don't throw away empty beer and soda bottles! You can recycle them into a pretty vase like this. work in a well ventilated area BECAUSE with a few bottles I found I had too much paint spray in the air and the paint particles dried mid air and landed on the bottles giving them a very grainy texture. Had to reject a bunch for that reason. Decorating the bottle vase: I just love Stampin'UP! 's glimmer papers. They're a really nice quality and such pretty colors. 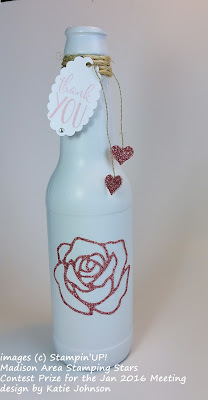 I used Blushing Bride on this bottle, but with Valentine's Day coming up it would look stunning in red glimmer paper too! Or maybe for a wedding, spray the bottles black and cut the roses from white glimmer paper? Suddenly I'm thinking of lots of variations here. First step is to get the roses glued on. The glue tends to slip a bit on the bottle surface, so if you try this yourself go slowly with this step. Be patient and wait for the glue to dry a bit. The glimmer paper is good quality stuff with a firm backing, but that also makes it want to resist the curve of the bottle so you'll have to hold it on til the glue sets. Which is why I recommend the Liquid Tombo, you can control it to get a thin bead on the die cut rose and it sets fairly quickly. Stampin'UP! 's Linen Thread was a perfect match for tying on the tag. 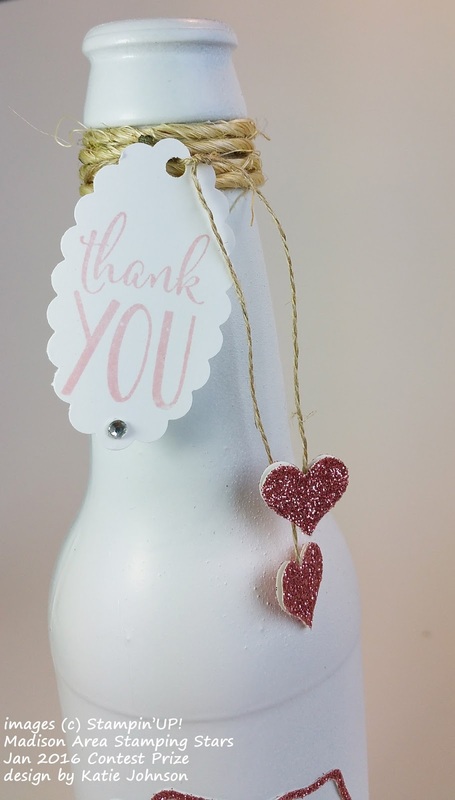 The little hearts at the ends of the thread were adhered with glue dots.